Born in 1992 from the cold winds of Montreal, Québec, Canada comes one of the country’s top extreme musical exports to date: KATAKLYSM. Relentlessness and a hard work ethic have made KATAKLYSM a household name in the extreme metal genre in addition to their overwhelmingly positive reputation of fan-friendliness. With a career spanning over 20 years, KATAKLYSM is a leading force in the most brutal & powerful genre in heavy metal and has conquered territories such as Europe, North & South America, Australia, and Asia while recently becoming the first Canadian metal band to ever play South Africa. KATAKLYSM’s 2013 studio album, Waiting For The End To Come, experienced worldwide success in terms of album sales and touring. Around the globe, the band played to full houses and paved new in-roads into Brazil, Japan, and South Africa where they played to their native fan bases for the very first time. That same year, KATAKLYSM won the “Metal Band of the Year” Award at the renowned Indie Awards ceremony in Ontario, Canada and soon after, was nominated in the “Best Metal/Hard Album of the Year” category at the prestigious Juno Awards (Canada’s equivalent to an American Grammy). 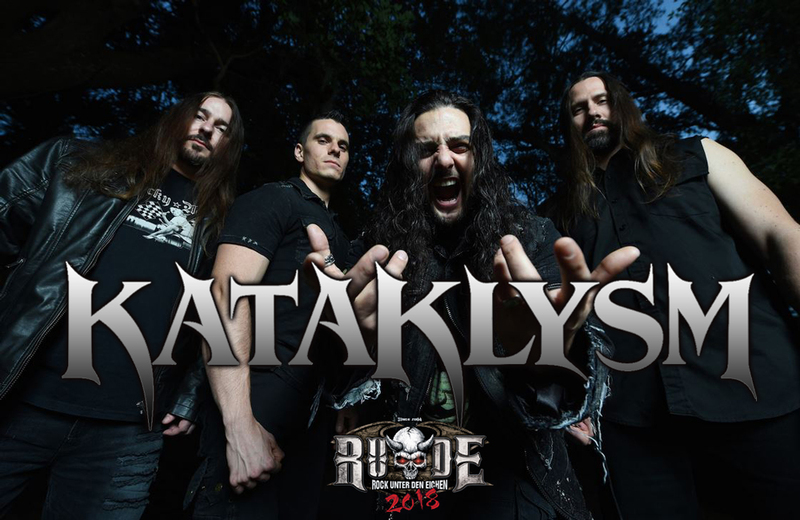 Fueled by the loyalty of their legions of fans who have made so many of the band’s accomplishments possible in their nearly twenty-five years of existence, the members of KATAKLYSM become even more inspired, determined, and unapologetic in their rise to the top of their genre by any means necessary. It’s now 2015 and KATAKLYSM are at it again – like a train that can’t stop its raging momentum. With the completion of their twelfth studio album, Of Ghosts And Gods, KATAKLYSM is prepared to unleash a tsunami of the best possible hurt among the masses. Of Ghosts And Gods was recorded in three different studios from Montreal, Quebec to Dallas, Texas and Sanford, Florida in order to harness the expertise of the metal industry greats who best understood the band’s talents and their vision. Album tracking was entrusted to longtime producer/ KATAKLYSM guitarist J-F Dagenais (Despised Icon, Misery Index, Malevolent Creation); KATAKLYSM frontman Maurizio Iacono recorded his vocals with producer Mark Lewis (Cannibal Corpse, Devildriver, White Chapel) at Audiohammer Studios; album mixing was masterfully handled by legendary producer Andy Sneap (Megadeth, Amon Amarth, Testament). The result is Of Ghosts And Gods – a melodic affair of top notch brutality graced with intelligent songwriting. As expected, KATAKLYSM’s famous body-slamming riffs and grooves never falter. Upcoming artist Surtsey (Occvlta Designs) designed sinister album artwork depicting the reality of humanity’s beautifully disturbing existence and its impending death. Endorsed by producer Mark Lewis as “KATAKLYSM‘s best album to date,” Of Ghosts And Gods demonstrates how – just like fine wine and an expert demolition crew – KATAKLYSM just keeps getting better with age.